Can you take the best of traditional DVRs and merge that with the best of megapixel IP video? That is the objective of a new recorder from Lilin called the 'NVR Touch'. In this note, we examine with features, pricing and positioning of the unit compared to VMS software and NVR options from Milestone, Exacq, Synology and QNAP. On the IP side, Lilin says the recorder can operate as both server and client, noting support for, "16 streams at 25fps per stream and at 1080p for display and record, HDMI output for the main monitor plus an independent spot monitor that can give any multiscreen view independently or work as a spot." While this is common for DVRs, many IP based NVRs are expected to only record but not locally display video. 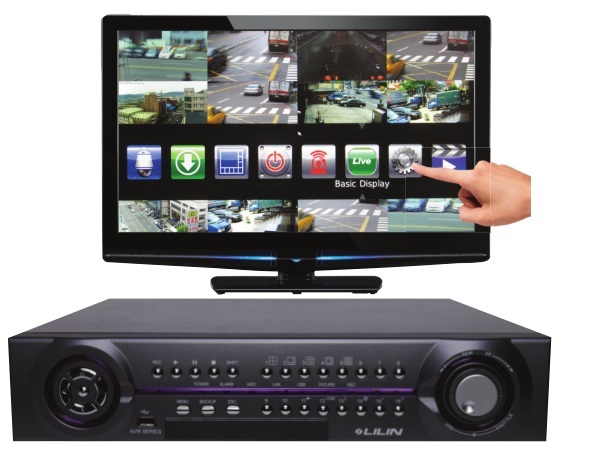 Lilin offers 4, 9 and 16 channel version of the NVR Touch (thoughly only the 16 channel unit is shown on their site currently). According to Lilin, the 4 and 9 channel version's main differences are a smaller form factor and no integrated DVD writer. Street pricing of the 16 channel unit, without hard drives, is estimated to be ~$2,000 USD. The recorder supports up to 8 hard drives, JBOD only, no RAID support. On the one hand, we are skeptical about the adoption of touch screens within the surveillance market. Our recent poll and discussion notes many concerns. However, it may be an interesting differentiator for some. More importantly, we think the use of a small number of large buttons simplifies use for non-technical and untrained end users. As our survey results of end user VMS complaints shows, usability issues are a major concern. This NVR could be highly attractive for users who prioritize simpler operation and may be especially useful for those organizations more comfortable with the simplicity of their traditional DVRs. NAS NVRs, like Synology and QNAP, will be moderately less expensive than the NVR Touch. Additionally, they support storage redundancy while the Touch does not. On the negative side, most NAS NVRs require a separate PC for local display (though QNAP's PRO series has a VGA). More importantly, the user interfaces of NAS NVRs are typically rudimentary and may be viewed by users as inferior to the Touch's. Embedded professional NVRs like the Exacq EL series, Milestone Essential NVR and Razberi M16. The EL series has the advantage of supporting analog cameras directly on their hybrid units while the Razberi has a built in PoE switch. Additionally, both appliances offer support for more established VMS software (Exacq and Milestone via Razberi). However, the Touch will likely be less expensive than those units. Additionally, the simplified user interface of the Touch will be a differentiator to those looking for a more traditional DVR experience.